written by a girl: A bird? A plane? 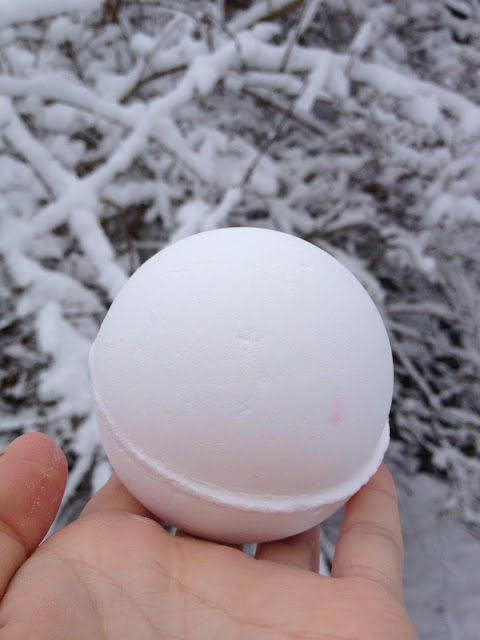 A snowball? No, it's a Lush bath bomb! A bird? A plane? A snowball? No, it's a Lush bath bomb! Ok, so yesterday I ventured outside, on my amazingly lazy 'snow day', into my snow filled back garden, because I'm a dedicated blogger(or maybe because I wanted to run around in the snow..) to take some pictures with a pretty, scenic background. Fortunately, it was worth it however my toes and nose didn't agree..! I'm not someone who is obsessed about Lush products however whenever I'm near the shop, I do get sucked in by the amazing aroma and, obviously have to buy something. This bath bomb is called 'So White' and smells...appley? It literally smells just like apples, citrusy and fresh, not what I would expect a snowball to smell like but I'll go with it! Now, when I used this last night, I decided to push the boat out, and put the whole thing in; and as it happily fizzed away, it slowly turned my bathwater white! Basically, I bathed in amazing smelling milk...and loved it! It isn't too overpowering, yet it's not like some cheaper bath bombs where you don't even notice you've used one. Really subtle yet really relaxing, leaving a gorgeous, fresh scent lingering on the skin! What are your favourite Lush products? I really want to get into them because I hear so many good things about the brand yet become overwhelmed when I go into the store! This looks amazing, love a Lush bomb! Really need one! Really want to try this just for the white water!